A very happy new year to all our readers and we thank you for your continued support. This year is going to be a very big one for most of us in terms of what we are going to achieve. The London 2012 Olympics is just one of the many goals that a lot of people are working towards this year and as such, I have decided to kick-off with an article on teamwork. Working together in a team can be one of the most fulfilling things we experience because everyone has a specific role to play in order to achieve a common goal or objective. It becomes fulfilling when the project is completed and we can clearly see what we have all achieved, knowing that we have had something to do with it. But sometimes projects do not always come together smoothly and I believe the reason for this is lack of efficient teamwork. A team becomes inefficient when it has no defined purpose, or the team players do not understand each other or their individual roles. This can become very problematic as most projects with such issues do not often come to fruition. In fact, such issues make projects drag out longer than they should and this has a very direct effect on the cost and quality of the work being done. In other words, you end up with a very expensive product that is lacking in quality. In searching for ways to avoid such pitfalls in my own work, I became aware of the fact that the perfect team should operate like a game of chess. Chess is a beautiful game with lots of strategy and planning but most importantly, it is a game that has 6 very different pieces who perform very different things. Furthermore, I noticed that it is a game that is set up to operate like most organisations due to the fact that each piece actually represents a certain level within a hierarchical structure. 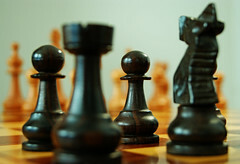 Let’s now explore each of the chess pieces and see how useful they can be when applied to the world of business. The game of chess as most people know is basically about protecting your king while attempting to capture the other side’s king. Therefore the king is a very important piece in the game as all other pieces tend to revolve around him and what he does. In a business setting however, the king happens to be the Chairman, Director or Chief Executive of that organisation and it is with this person that the vision and main decisions of the company lays. It is the Director who the rest of the team look to for guidance and direction. If a company’s Chairman does not clearly set out the agenda for the team in a way they can understand, then inefficiency is likely to creep in at some stage. A good king or leader knows who is best for what job and knows how to delegate accordingly. They say the queen is the strongest piece in the game because she is allowed to move freely across the board. I agree with this because in business, the queen is actually the public or human relations arm of the firm. For this reason, she does need total access to all members in the boardroom and beyond. She is closest to the king and needs to be so in order for his wishes to be effectively communicated to the rest of the team. If the queen falters, then it leaves room for bad press to come in and ruin your business’ reputation for she is the public face of the whole team and therefore needs to be an expert communicator and an expert people’s person. Since public relations is crucial to your brand, you really need to make sure that you have the best queen in your dream-team. You will find that the bishops are closest to the king and queen on the board. They occupy this position because they are actually the royal advisers. They inform the king and queen on the state of all affairs and advice them on the best course of action to take. In the world of business, these people happen to be your company’s financial, legal, and political advisers and they are crucial to the success of your business. The wrong or no information from them could open huge areas for the enemy to stage an attack and for this reason, it is very wise that you consult with your financial and legal advisers on a very regular basis. It is also very helpful if such people are aware of exactly where, when and what their advice should be. The knights are those who go and fight on behalf of the king and queen and if they win, they come home with the loot and booty and are entitled to a fair share of the spoils. In business, these people are actually executive-level managers and associates of the business. They go out into the big wide world and solicit for business on behalf of the company. They propose bids and are skilled at negotiation. If they do win work for the organisation, they are compensated by having a share of the company’s total profits, including their standard salary as the company’s warriors. Your knights are some of the most important people in your team and losing them will definitely cause a gaping hole to appear on your bottom line. If the knights can be seen as attackers, then the rooks are the royal defenders. They reside in the castle and cater to everything the royals may require. In business then, if the knights are managers, then the rooks can be seen as the in-house supervisors. They are the ones that make sure everything runs smoothly in the office and everyone under their command should be very aware of what their roles are and what is expected of their performance at any given time. Your rooks will be on the look out for possible conflict and they will help you to defend your city gates when trouble approaches. It is therefore wise that such people in your team should be very disciplined and work closely with the queen. People like to think that the pawns are the peasants who are disposable to everyone above them and for that reason, they are perceived as not very important but that couldn’t be further from the truth. It is true that in the game of chess, you can lose a few pawns and still turn out alright but losing more than a few will quickly help you realise that you may be fighting a lost battle. In business and teamwork, your pawns are your shop-floor staff members; the people who actually do most of the ground work to keep all other team members operating smoothly. They are probably the most important set of people within any team formation. For example, footballers on the premiership’s pitch occupy this pawn or ground-work position but the football club and all its other departments will all amount to nothing if these players do not go out and play. Pawns are greatly needed within the team and as long as they know what they should be doing and are good at what they do, you will have a fantastic team that delivers great results. Now that you know and can see the similarities between the game of chess and teamwork within organisations, it is very important that you take some time out to find out where you fit on the grand chessboard. Are you a leader who can take the place of the CEO King? Or maybe you are skilled at advising people on best practices and can be the Advising Bishop. Whichever one suits you best, make sure you familiarise yourself with all that is required of that position. But more than anything else, be sure to play your part to the best of your abilities so that your other team-members can easily get on with their own activities. In this way, I believe we can all remove inefficiency from our working projects and deliver great results in time and within the set budget. Good luck in all your endeavours and have yourself a wonderful 2012! Do You Have A Chess-like Team? © 2011 Nyoremes Books, a subsidiary of Nyoremes Inc.
a great article to help attain ones potentials this year. thanks to the writer of this simple yet profound article. Thanks for reading Ason … much appreciated.